But first… I remember a skiing trip my family took when I was around 10 years old with a bunch of other families from Seattle. At night, while the parents sat together over boring drinks, recovering from a long day of keeping track of mittens and lugging skis around, we grabbed our swimsuits and ran outside. Just fifteen feet from the edge of the building, a mere four or five giant barefoot leaps through the snow, was a fantastic above-ground hot tub. 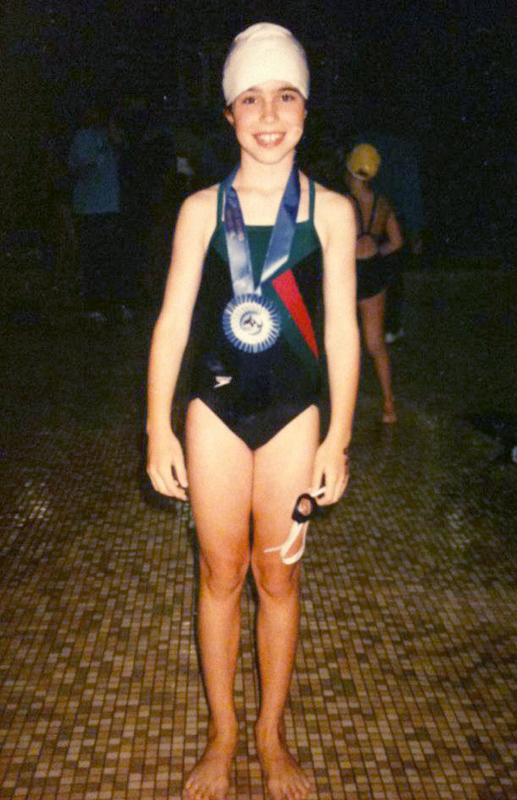 ~1990 – Here’s me around 10 years old at a swim meet. I was a breaststroker. After splashing around and playing in it for a few minutes, we would find ourselves sitting on the edge of the tub with just our legs submerged, our small, overheated bodies relishing the fresh air that turned to clouds of white steam as it hit our hot skin. It wasn’t long before we were exchanging dares, and then organizing competitions to see who could hold their breath the longest in the tub, and then who could lie their freshly-boiled, nearly-naked body down in the snow for the longest before jumping back into the scalding water. The funny thing about this memory is that I don’t remember who the other kids were really, just that I was one of the youngest. What I remember very clearly is loving the competitions, and repeatedly winning them both. I thought of this memory, and others like it, periodically through my 20s. As I had gotten older, I came to describe myself as “cold-averse,” and “easily chilled,” and I avoided the cold whenever possible. As I opted out of one cold activity or another, I wondered what happened to the fearless little girl who won those competitions nearly-naked in the snow. When I did my first triathlon on Staten Island in June of 2010, a friend showed up without a wetsuit and I thought she was crazy. Xlendi Bay, Malta, 2011: Rounding the buoy at 4hrs10mins, sandwiched between new friends swimming with me for moral support. Then, at age 30, I decided to start swimming far in the ocean and I signed up for a long-distance swimming trip in Malta. Of course it wasn’t until months later, after paying for both the trip and the airfare, that I thought to Google “What is 15 degrees Celsius in Fahrenheit?” It was then that I realized I was not signed up for a warm-water swimming retreat. What was I thinking? 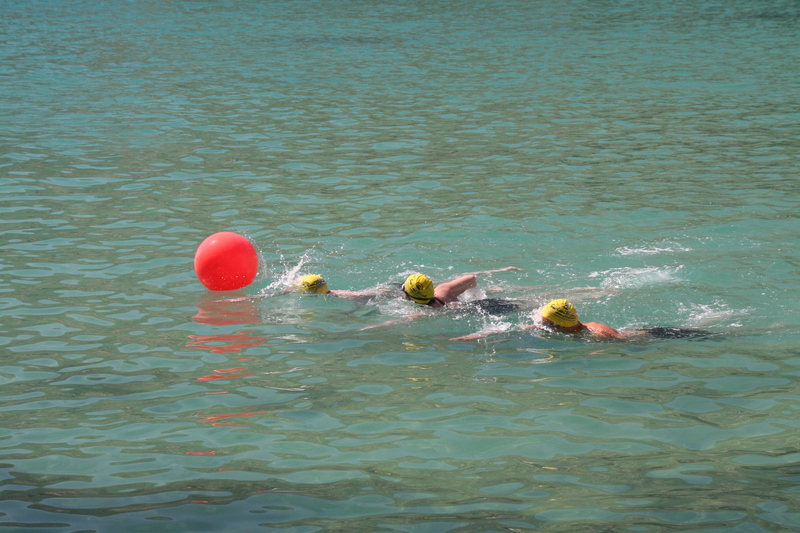 I had thought the challenge of distance sounded amazing (a six hour continuous swim?! 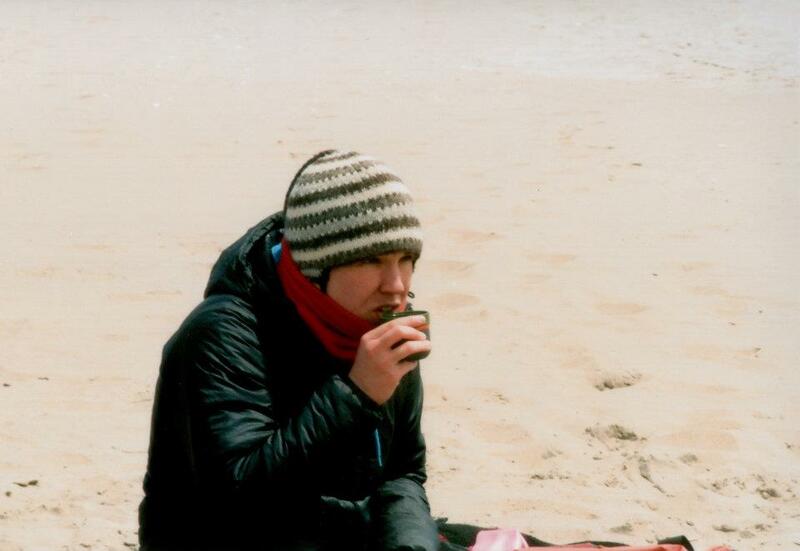 ), but the idea of doing it in cold water was a challenge I had not even considered, because, you know, I’m cold averse. I felt like an idiot for not researching it all earlier. It turned out to be a life changing experience. For starters, I got a crash-course in open water swimming, of the Channel variety, and left feeling quite knowledgeable. That six hour swim was one of the hardest things I’d ever done, my body hurt (before I began!) and the water was cold. I swam for hours in a very dark mental place, but finished the swim feeling light, and inspired by the power of love and support of near strangers. I had conquered the cold, in a way, and apparently, in doing so, I had awoken that 10-year-old and her excitement for a good cold challenge. 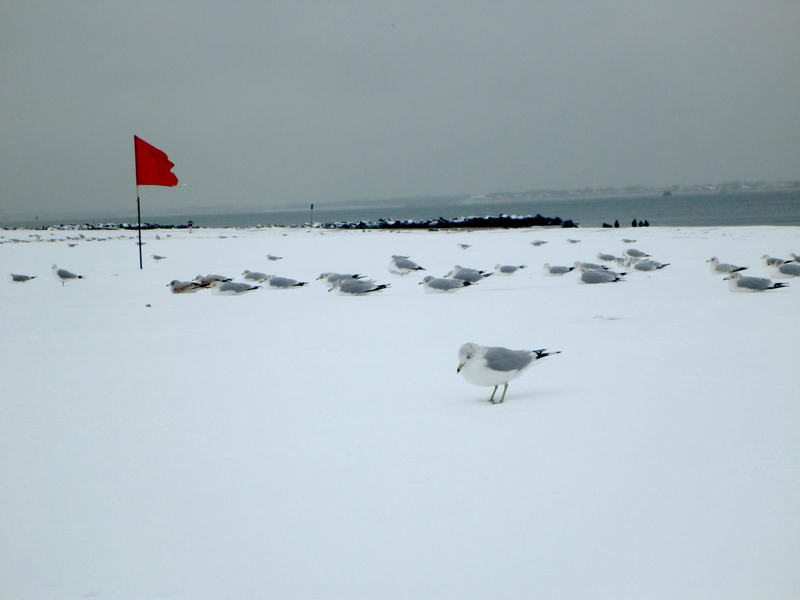 January 7th with Capri at Brighton Beach – Bright, sunny day is deceiving. That water is icy cold (40°F)! This January, at 31, I reconnected with my little champion-of-the-cold self. 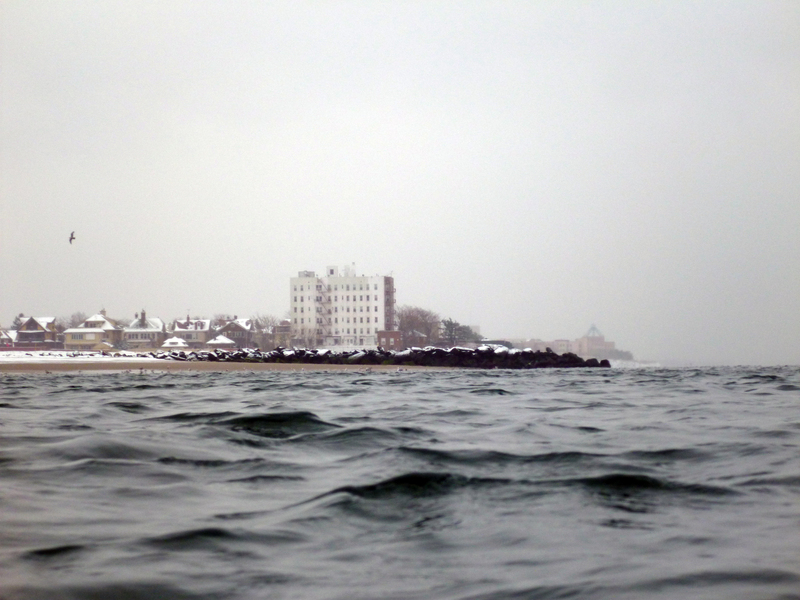 I began winter ocean swimming every weekend, in just my Speedo, even when it snowed. Due to shoulder pain, and subsequent surgery, I had been out of the pool and the ocean since August. My heart was aching for the water, and on the 1st of the year, I was ready to get back in, if not for an actual swim, then at least for a dip. 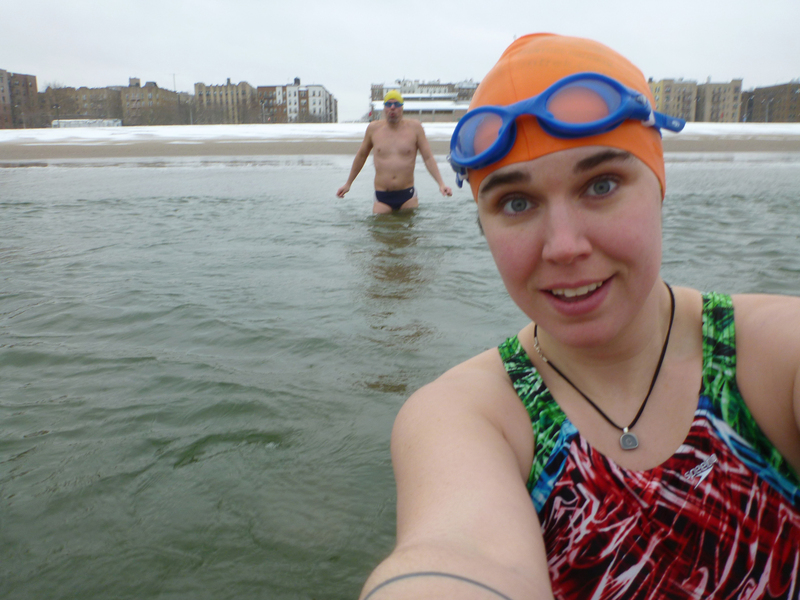 But, on January 1st, when CIBBOWS, Polar Bear friends, and hundreds of strangers descended upon Coney Island for the annual Polar Bear swim, I was on a plane flying back from Seattle. I would have to make my own plans. 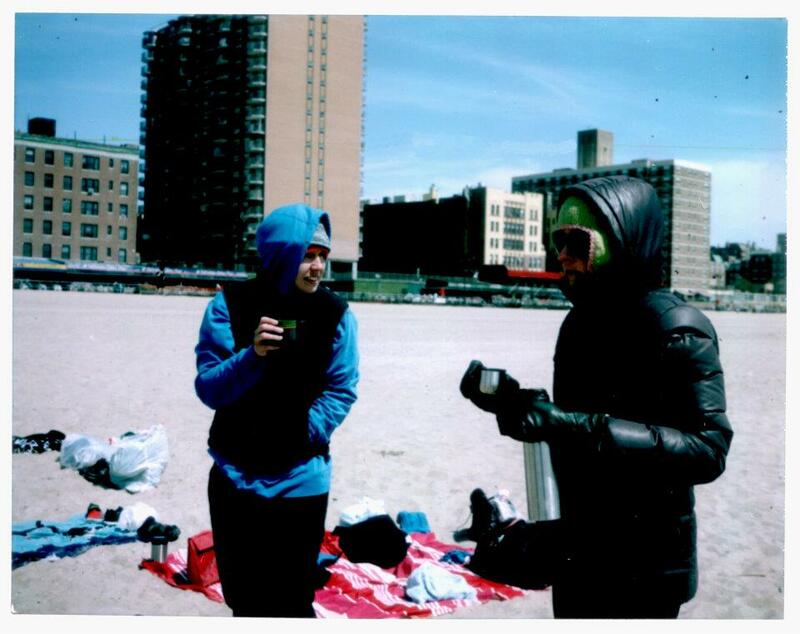 So on January 2nd, I picked up Laura and my friend Gabe in Park Slope, and headed for Brighton Beach. It was my idea, so I knew there was to be no chickening out. 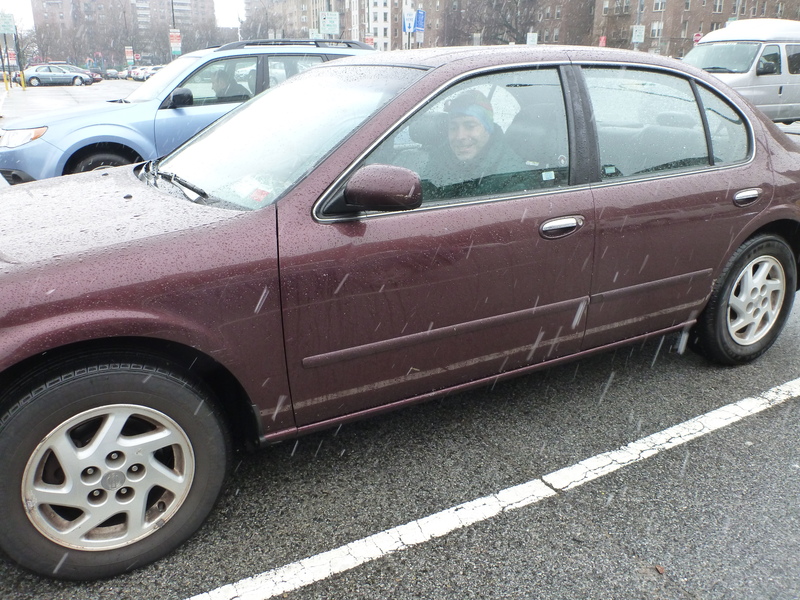 In fact, despite my apprehensions, I filled the car with upbeat, encouraging banter. I’m sure this is the first either of them are hearing of my doubts. In the warm car, I cringed at the thought of standing in the cold, winter air, in just my swimsuit. That was the part I was sure would be the worst. That first swim was short. Gabe, who had stories of his own ice-swim in college, was out of the water in an instant and getting back into his winter clothes. Laura lingered for a few seconds, but later admitted that she never put her head in. I was surprised to find it felt almost pleasant. I hung out for a few minutes enjoying the numb yet totally tolerable sensation, and then joined my friends on the sand. I was hooked. I started heading out regularly, and swimming between 15-20 minutes most weekends through January and into February. The thing about swimming in really cold water is that it is so cold that it doesn’t feel cold. It feels weird. It feels a little like ice is forming in my fingers. That’s certainly a weird feeling. And my face hurts for a few minutes before I am able to hold it down and swim. Also weird. Usually, I got out because the people I was swimming with got out. I figured they knew better than I did, as they were all more experienced at winter swimming than I was. I often felt like I wanted to stay in longer. 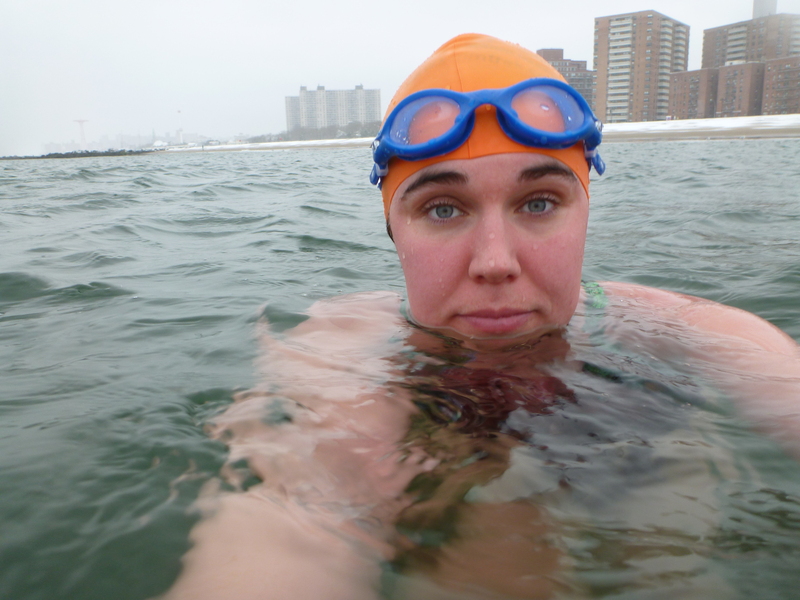 But the wisdom of getting out when we did was felt after each swim, when I sat in my car with the heat blasting, wrapped in my warmest winter clothes, shivering from a deep, inner cold, sipping hot tea. Every weekend at that moment I thought, this is crazy. I’m never doing this again. But come Thursday or Friday, all I could think about was getting back in. 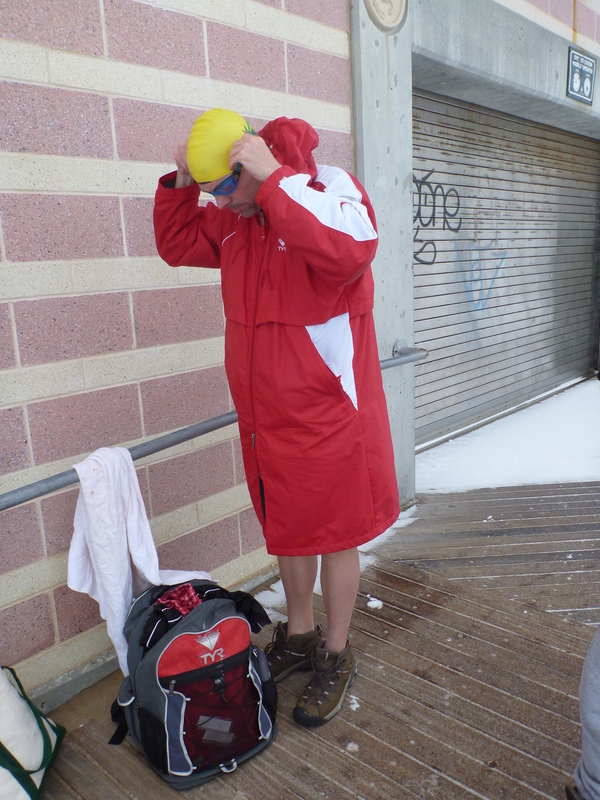 January 21st, 2012 – As Ted swims, Brad and I suit up by the bathrooms. Here are some notes from most of my swims this winter. With less traveling planned next winter, and no surgery (fingers crossed) in the fall, I hope to get in a much longer season. 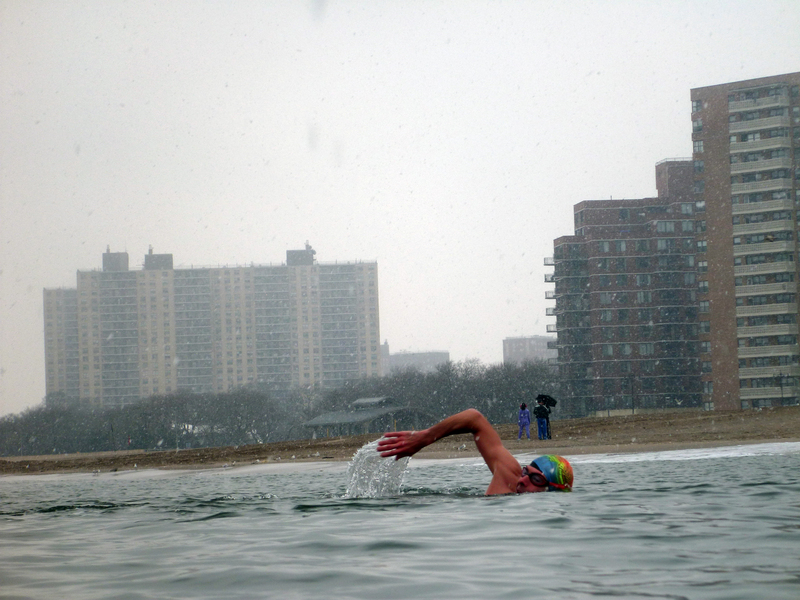 1/2/12 – 1pm Brighton Beach OWdip (w Laura and Gabe) 45 degrees. Frozen toes. Only in for a few minutes. 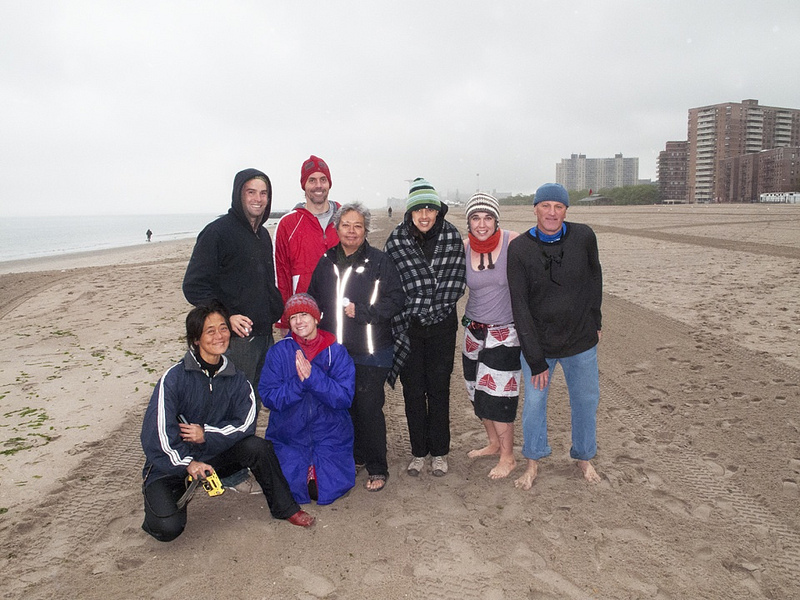 1/29/12 – 11am OWS @ Brighton Beach (w Brad). 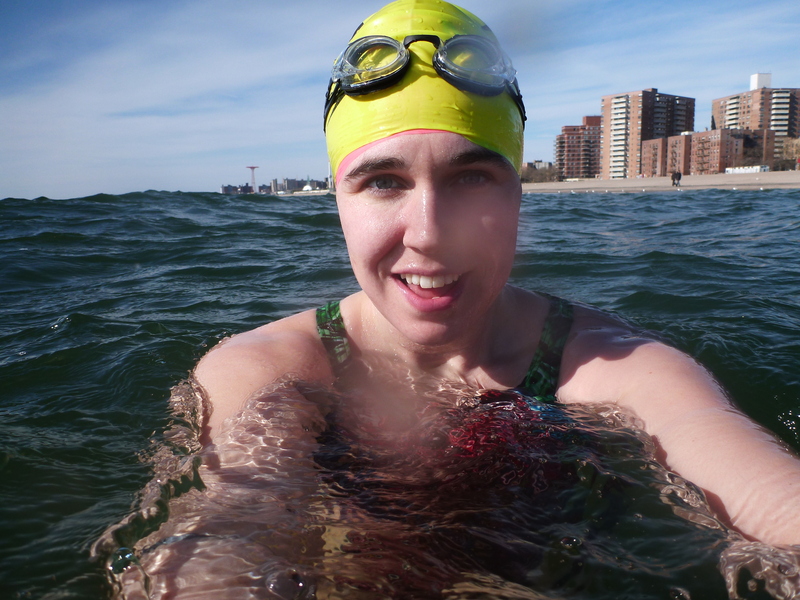 Crazy cold water, ~39, but sunny, which helped psychologically. Earplugs and socks. Hands and face suffered. 4/9/12 – 1pm OWS at Cowell beach, Santa Cruz. 52 degrees, lots of kelp. 30 minutes. 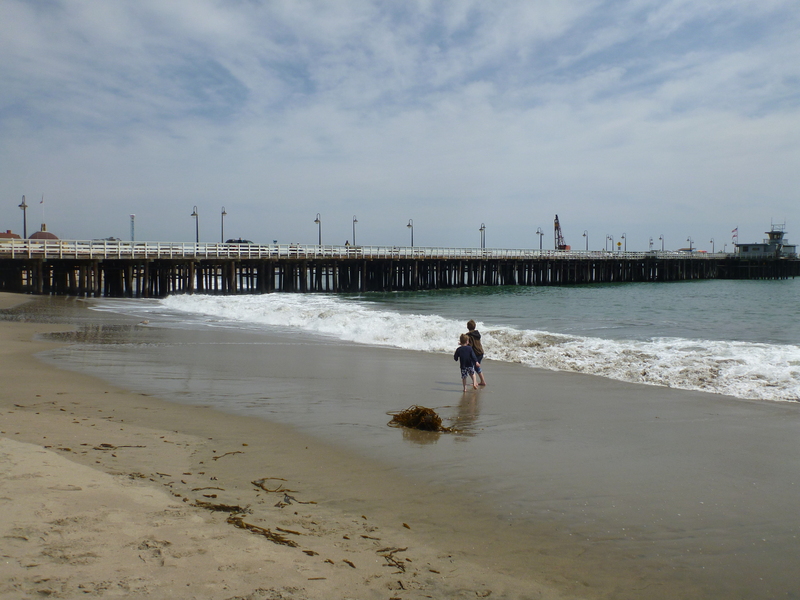 4/14/12 – 11am OWS at BB (w Cara) swam into current towards pier, flew back. 50 degrees. 35 minute swim. 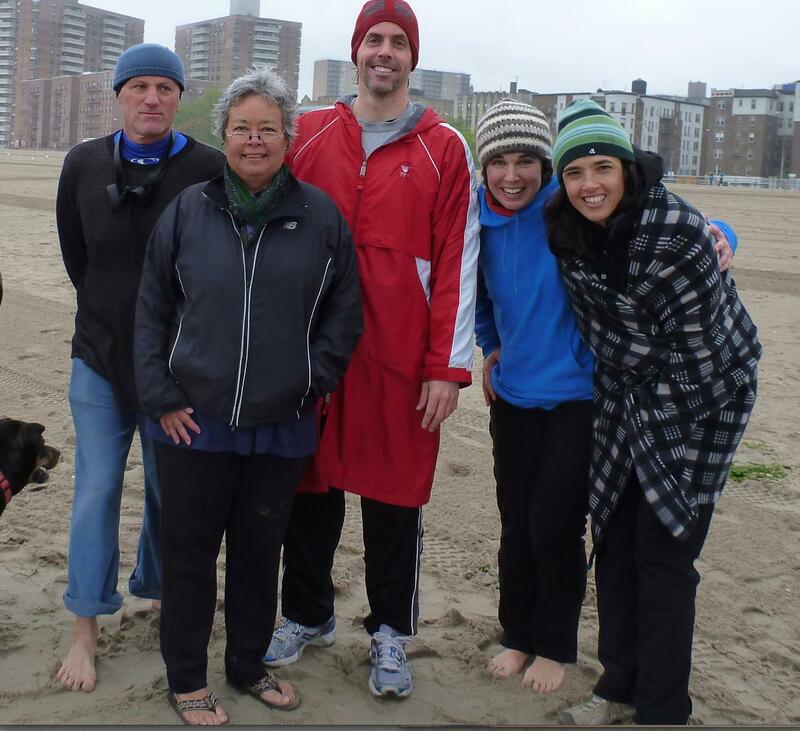 4/21/12 – 11:30am Brighton Beach Swim. 52 degrees. Swam with Cara towards pier to the short jetty, then back other way to white building (into very strong current) and back. 1 hour total. 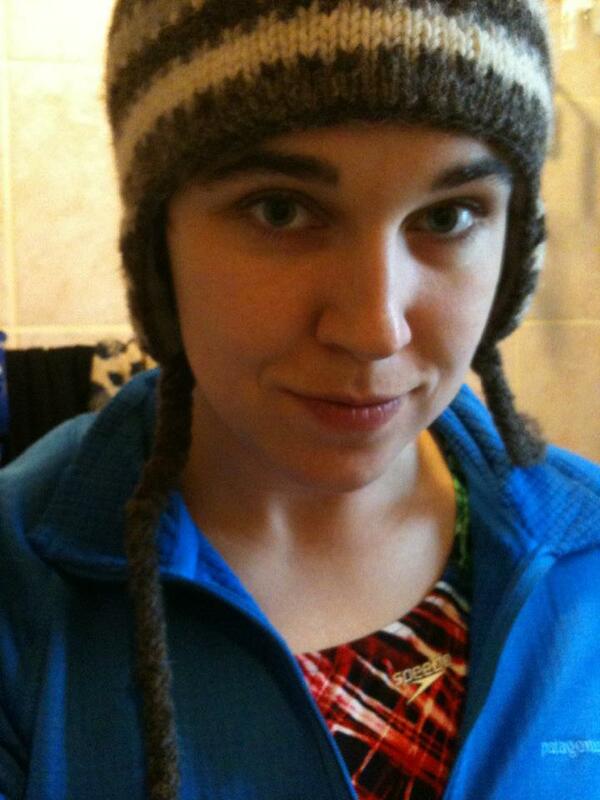 March 27, 2012 – Showing off my signature Speedo-under-Patagonia-fleece-alpine-base-layer-with-winter-hat look. 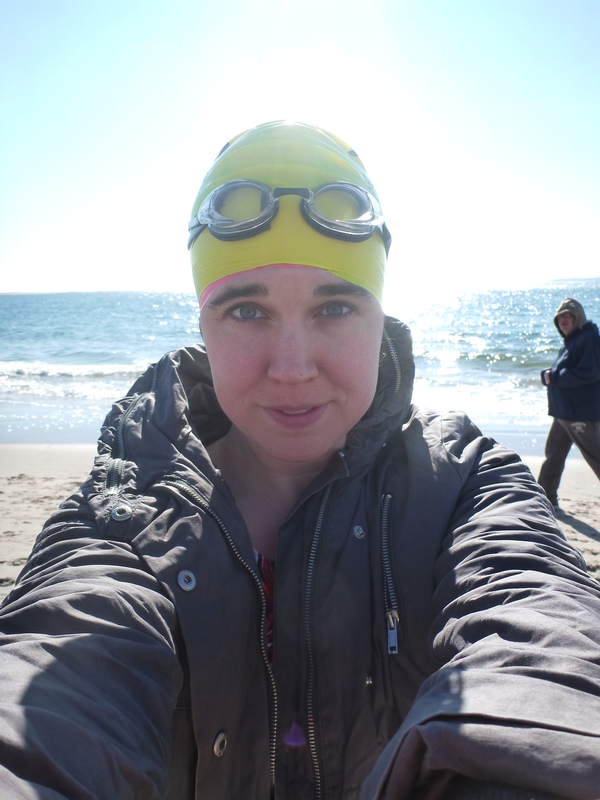 January 29th, 2012 – Pre-swim on a cold but sunny day. No need to huddle by the bathrooms. 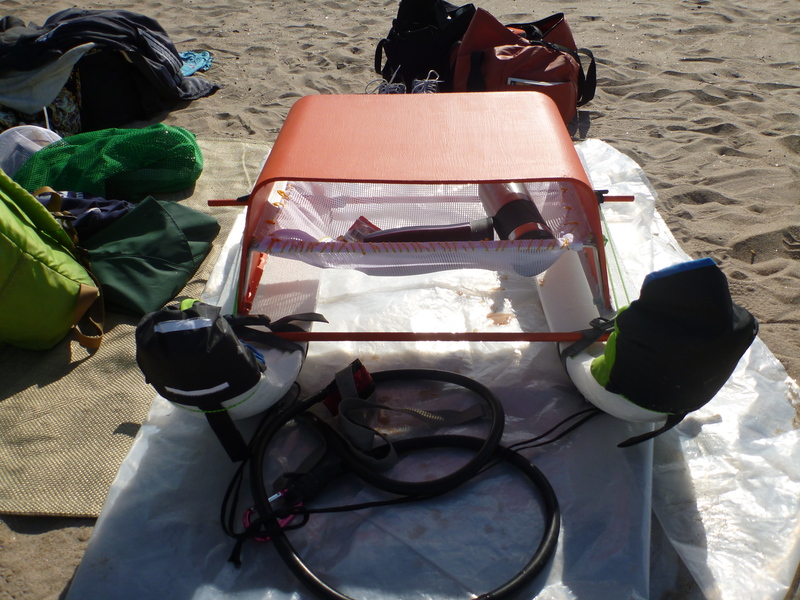 January 29th, 2012 – Brad and Eli taking their sweet time, perhaps trying to soak in a little sunshine before the swim. February 11, 2012 – It’s snowing. Eli gets ready in his car. 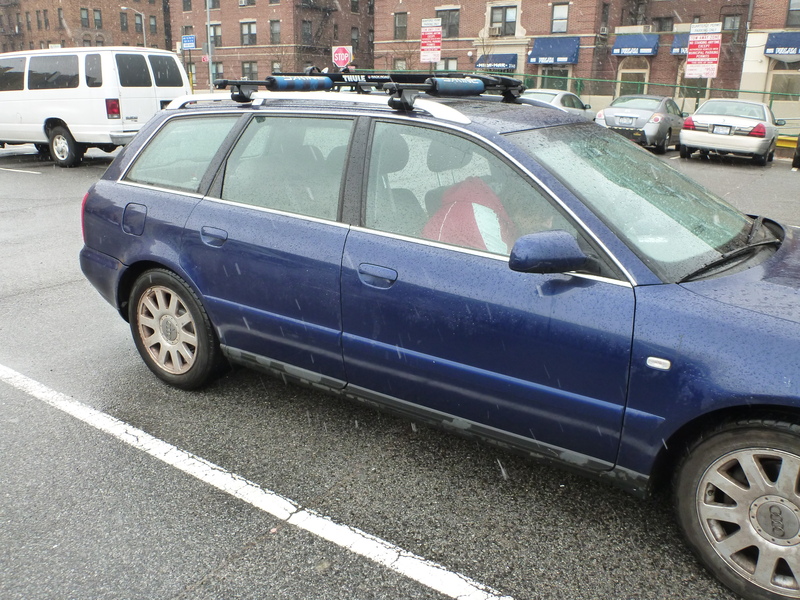 February 11, 2012 – It’s snowing. Brad gets ready in my car. 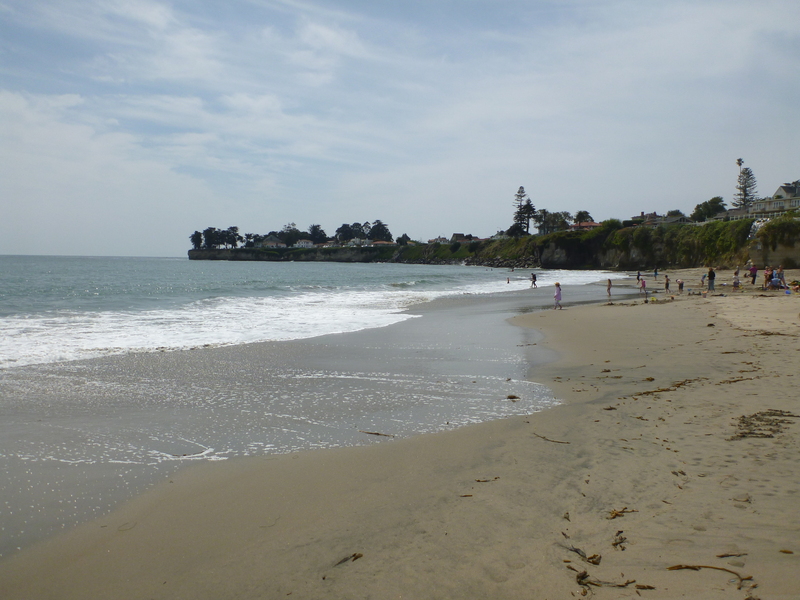 April 9th, 2012 – A warm day at Cowell Beach in Santa Cruz, with relatively warm water. 52°! 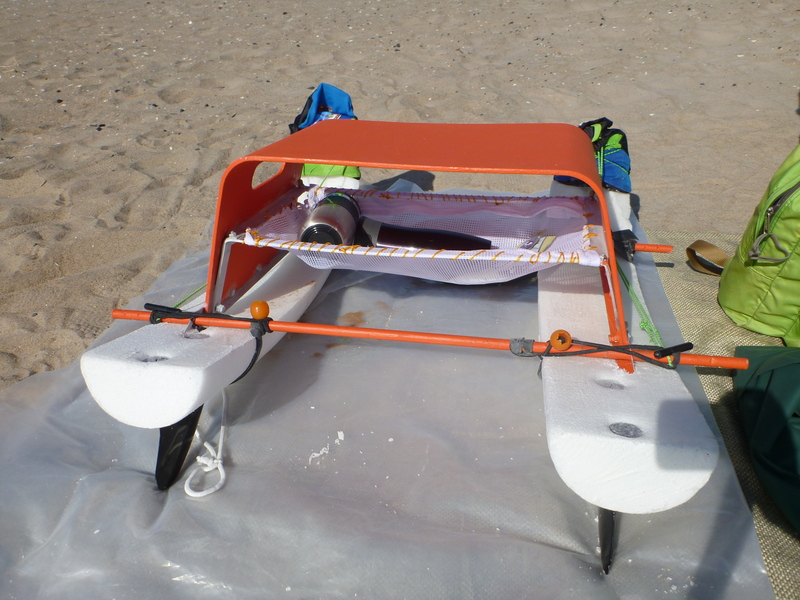 April 14, 2012 – Giles’s ocean sled feeding station. He pulled this behind him as he swam alongside Brad during parts of Brad’s crazy 3.5 hours in 50°F water. 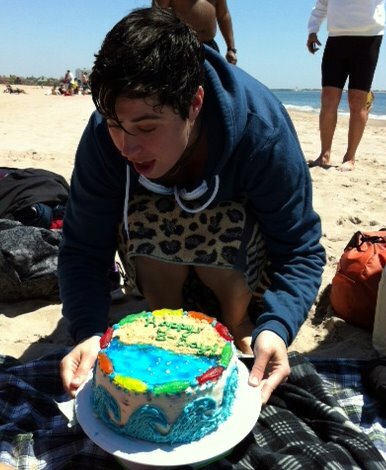 May 12, 2012 – For my 32nd birthday, best birthday cake ever. Baked and expertly decorated by Cate. After three weeks in a row of swimming for an hour or more, I had to admit that the winter was over. 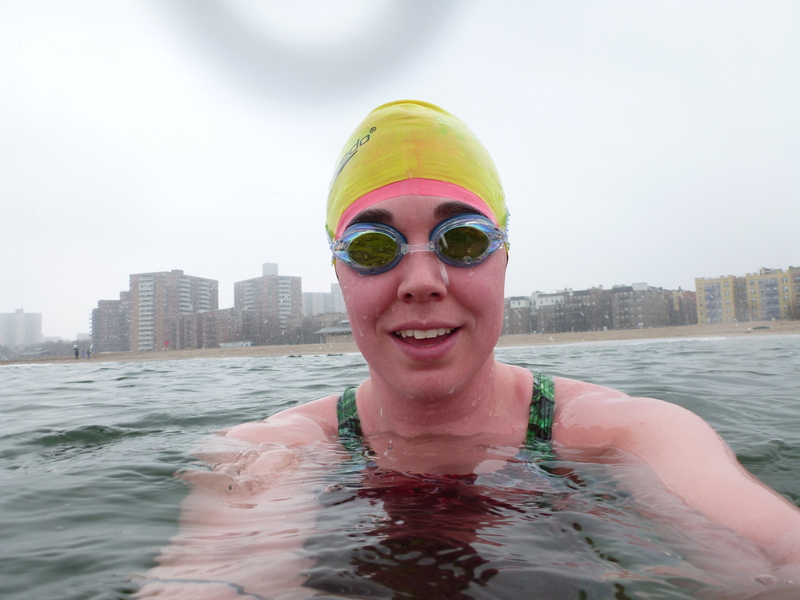 The water got up to a balmy 55, and I no longer needed my post-swim layers of long-underwear, fleece pants, down coat, winter hat, and fleece neck wrap. (Note that 55 degrees F is actually still pretty cold, but after a winter of swims in the 40s, my body seems to be somewhat acclimatized.) Big thanks to Brad for helping me to get acquainted with swimming in the ocean in the winter. 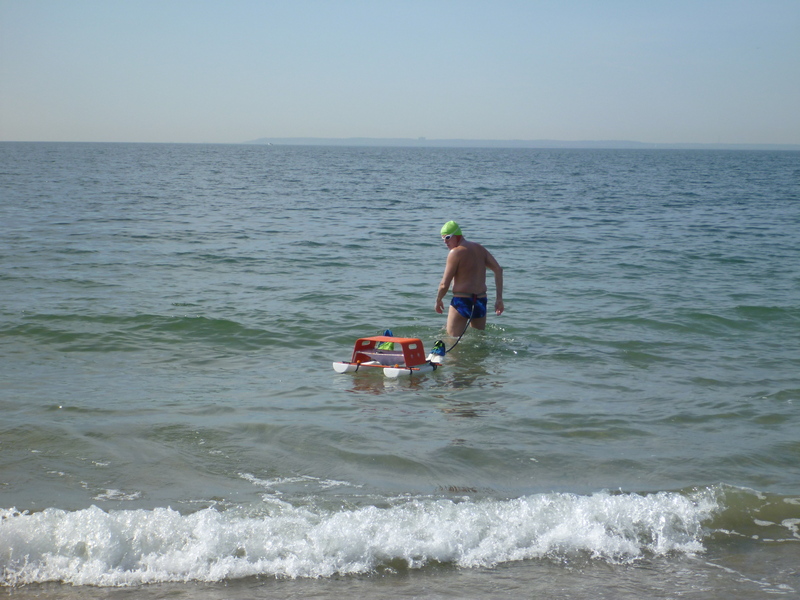 He swam every weekend the previous winter, too, in training for his English Channel crossing. 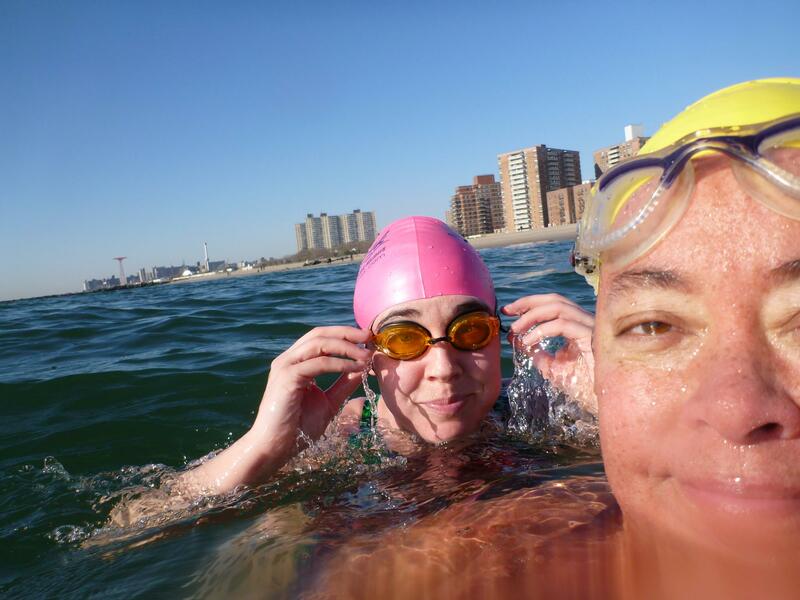 He said that he continued to swim through this winter out of habit, even though he doesn’t have any big, cold-water swims planned for this season. I’m so hooked, I’m already looking forward to swimming through next winter. Highlights of late-May and June include the Great Hudson River Swim, kayaking clinics, and the Stars and Stripes Aquathon. Posts to come. Caitlin, I enjoyed reading about your winter swims! Great description of the feelings one has in water temps in the 40’s. Very few people can even imagine that! I remember that Neoprene sock development. How funny that back then it was to get to 15 minutes! I’m subscribing right… now!